Why ambient? A math teaching style that’s whole and all encompassing, with themes that repeat many times through the years, is most likely to be effective and successful. Today’s blog will focus on the introductory overview for Kindergarten. Note that the Common Core Standards will appear in blue, followed by an ambient translation. In kindergarten, instructional time should focus on two critical areas: (1) representing, relating, and operating on whole numbers, initially with sets of objects; and (2) describing shapes and space. More learning time in kindergarten should be devoted to number than to other topics. Back in the 50’s, the local Catholic school I attended began with first grade, so my kindergarten experience was similar to the Waldorf model. That is, a homey environment where I helped with chores by following in the footsteps of adults, and played in and out of doors for most of the day. Unstructured time such as this, devoted to creative, imaginative play and imitation of adults is most essential for the kindergartner. Therefore, instructional time and the concept of formal learning may not be the most desirable approach. It may in fact be possible to reach all of the goals described below in a more gentle, integrated way. Again, a formal learning environment is not optimal at this age. The above goals could be reached in the following ways. In a Waldorf Kindergarten or in a home environment (the two are often interchangeable) many opportunities arise for counting and acquiring a sense for the quantity of number. Playing with blocks or helping cook soup for lunch are two such opportunities. A whole carrot becomes a dozen pieces, or two towers of blocks represent single numbers that can be added together in several ways, by themselves and with each other. Thus the concepts of addition, subtraction, multiplication and division (and even fractions!) are put in place foundationally, in a much deeper way than if the child is required to abstract them with pencil and paper. (2) Students describe their physical world using geometric ideas (e.g., shape, orientation, spatial relations) and vocabulary. They identify, name, and describe basic two-dimensional shapes, such as squares, triangles, circles, rectangles, and hexagons, presented in a variety of ways (e.g., with different sizes and orientation), as well as three-dimensioanl shapes such as cubes, cones, cylinders, and spheres. They use basic shapes a spatial reasoning to model objects in their environment and to construct more complex shapes. Shape and form is optimally experienced through the physical senses: movement, verbal description, tactile observation. Shape sorters such as those used by toddlers (fitting a square in a square hole, etc.) are tactile enough but may be a reductive version of a more whole-body experience. 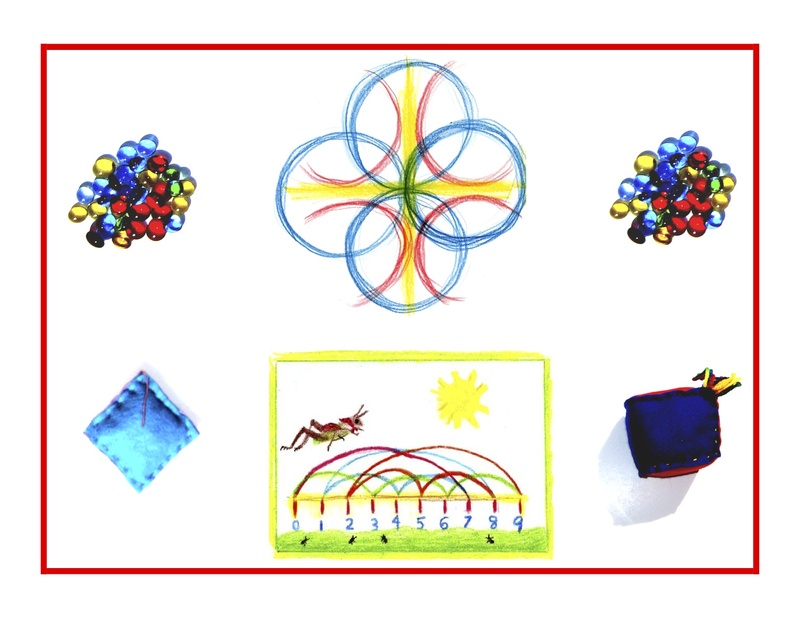 In the Waldorf first grade, numbers are connected with geometric shapes: 1 to a circle, 3 to a triangle, 4 to a square, 6 to a hexagon, etc. These ideas are related through fairy tales, such as “The Queen Bee,” later tied in with the bees’ hexagonal honeycomb. The number stories could be told foundationally in Kindergarten then related to their individual numbers later on, instilling a deep sense for corresponding shapes with number. The Kindergarten environment could be richly endowed with all such shapes, to be played with and experienced, but not yet abstracted into formal geometry. Last but not least, shape could be bodily experienced through movement: running in a circle, walking in a square, forming a triangle with arms and hands joined above heads, etc. This is an introductory overview, and will be followed by translating each standard individually into a more ambient mode. I only hope my penchant for making the abstract real and tangible in many and diverse ways will hold up through all of these complicated and complex standards! In closing, may I repeat that I believe the “back door” or indirect approach is a very effective teaching tool, especially with math. Most children will happily and eagerly take on any task presented in a friendly, warm, and meaningful way. In light of this, true knowledge ensues in an environment dedicated to imaginative, creative knowing, where student and teacher alike surrender to the ensuing of that knowledge as a worthy goal. More Kindergarten tomorrow!